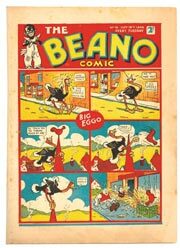 A copy of the first issue Beano with a faded cover has sold beneath estimate for £7,700, the third highest price for a British comic at auction. 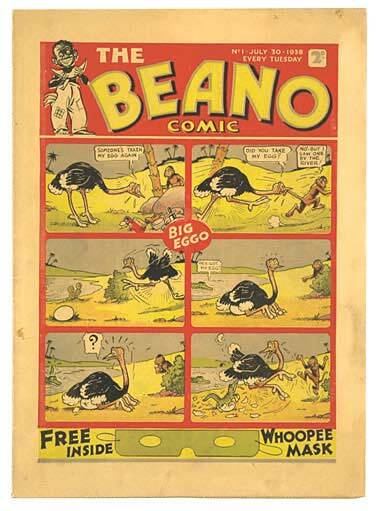 A run of early Beano numbers between 12 and 20 in Very Good minus to very good plus grades were sold generally in the £200-300 range each, with a very fresh copy of No 85 making £225 and a similar graded No 100 at £200. We have auctioned a number of 1933 first issue Hotspurs between £50-110 down the years and you would expect one with a taped spine and tan pages to fall into the lower price category. The difference was that this lowly copy was offered in November with its original free gift Black Mask, the only one known to survive, so bidding was intense with a final bid of £330 winning the day. It should be noted that DC Thomson also gave away the same type of mask with the first Beano comic some five years later when it was christened the Whoopee Mask, possibly after one of that comic's inaugural characters, Whoopee Hank, The Slapdash Sheriff. To our knowledge it was produced in several colours for that promotion, but not the original black as it may have been considered to be too sombre for the launch of a comic aimed at a younger market than the Hotspur. 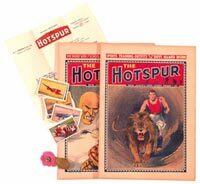 The other Hotspur lots showed prices between £20-30 each for issues 2-18 and £12 each for issues 19-122 completing the years 1934 and 1935 (in high grades with all free gifts). Early Hotspurs in average grades usually do well to get past six pounds each. 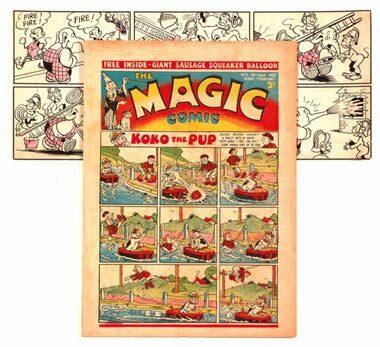 Magic comic only ran for eighty issues in 1939 and 1940 before succumbing to wartime paper and dyestuff shortages. Although the third sibling in D C Thomson's Beano and Dandy stable, the title is not nearly so well known due to its early demise so prices can vary although all issues are rare. We offered Magic No 2 with a rare artwork of Little Squirty by Chick Gordon from that issue. It made a magical £508.00. Charles "Chick" Gordon (c1890-1952) spent his career as a staff artist at D C Thomson starting work in 1922. He created Cheery Chinks for The Rover and the ever popular Spadger's Isle for the Wizard which he drew for twenty years, making the front cover during the war. 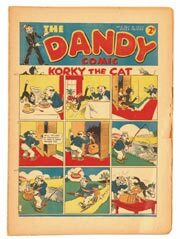 Amongst many other characters he also drew Bamboo Town for the newly launched Dandy in 1937 and Tin-Can Tommy for The Beano's back page in the 1940s. 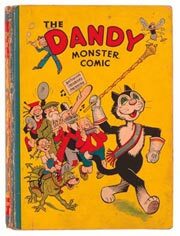 These early Dandy issues were offered in Very Good Minus grade as they were retrieved from a contemporary bound volume showing the resultant sew holes to each comic's spine. No 3 did particularly well at £373 whilst the No 5 made £165, in line with the further early numbers offered from 6 to 15. 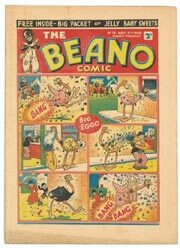 Beano 12 was Egged up to £200 with further early issues in that range, whilst No 15, the first Fireworks issue, rocketed to £325. 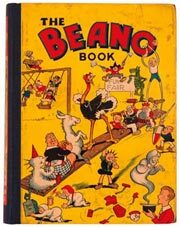 At lot 75 was a Beano Book No 1 that had been professionally restored with a complete new back board and spine onto which the original spine illustration was laid. Estimated at £900-1,200 this new, good-looking copy rose to £1,634 before being carried away by a knowledgeable Midlands collector. Potential bidders for our Dandy Book 3 from 1941 had scoured our back issue catalogues to see the last time one was offered for price comparisons. Unfortunately this was a fruitless task as we had never featured one since our auctions started in 1992. Consequently the bidding spiralled up to £1,650 from a high estimate £700 and our Midlands maestro snaffled this copy as well. Beanos in complete years in bound volumes continue to attract strong bidding and 1945, '46 and '47 garnered £373, £373 and £551 respectively. 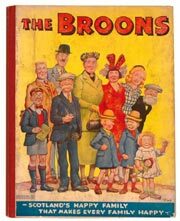 Scotland's favourite characters are always in high demand and these early bi-annuals that were only distributed north of the border were chased up to £441 and £660, especially as these particular copies were limited production hardbacks. 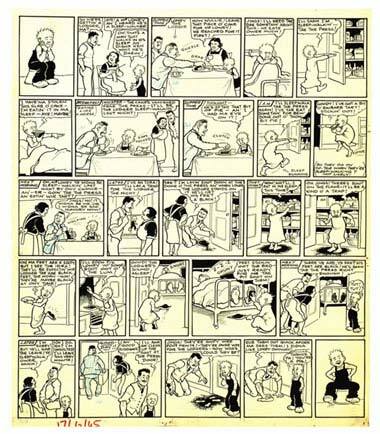 Oor Wullie's hilarious adventures continue apace with oor disgruntled wee hero getting pushed awa' by a lodger's greedy tea-time guzzling. 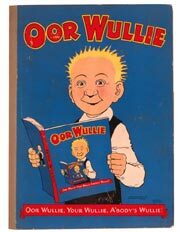 Wullie thinks up a way to blacken his reputation - and his feet as well! This Dudley Watkins beautifully crafted piece was bid to £940. 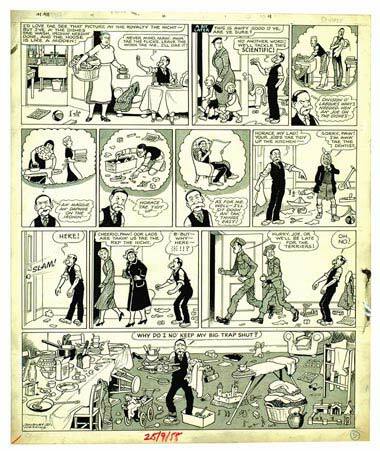 The 1955 Broons artwork had Paw giving Maw the nicht oot thinking that the rest of the family would help with the chores and clear up the midden. But they went oot too and he was left to do the lot hi'sel, including tidying up all the Beano and Dandys. Dudley Watkins made use of some early half-tone sheeting to bring even more dimension to this classic piece. A strong £1,320 secured its onward journey to the USA. 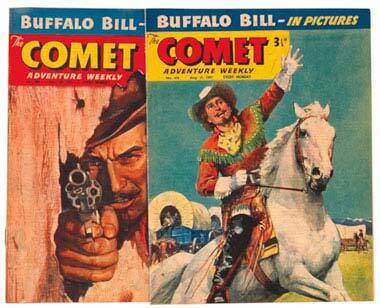 Buffalo Bill and Kit Carson's adventures were popularised throughout the Fifties by their continued front cover exposure in the weekly Comet comic and complete yearly runs do not come around that often. Also there were the ubiquitous rusty staples, an affliction that downgrades the freshest copy to "VG/FN". Offered in several lots, there was heavy bidding for the years 1953 and 1957-59 resulting in successful bids that broke down to £5 a copy, double previous values. Other complete years will be featured in our March catalogue in 2005. We auctioned nineteen mid/high grade lots of Super-Detective, Thriller and Cowboy Picture Library issues, the Detectives averaging £10 each, the Thrillers around £7 and the Cowboys at £4-6 each, their brightly coloured, well illustrated covers always popular. Surprisingly, a run of sixty-three facsimiles of early Cowboy Comics Library issues, copied in the early 1990s, were chased to £166. Fish Tries To Eat Cat Before Cat Can Eat Fish! Charles Griggs Dandy artwork from 1963 catjoled a fine £605 for only the second piece of his artwork ever offered for auction. 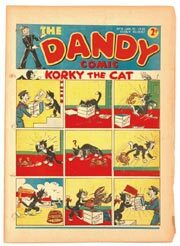 Charles Grigg started at The Dandy in 1962 and drew Korky The Cat for the following twenty years, eventually surpassing artist Jimmy Chrigton's original output. Griggs highly crafted and prolific work for The Dandy included Charley The Chimp, and adventure strips The Red Wrecker and The Umbrella Men. He also drew Foxy for The Topper from 1953-1976. Corpl. Clott's bull charges through the barracks and the visitor's red carpet catches fire as Col. Grumbly vows retribution. David's Law's artwork rarely comes to auction and this full colour piece from the Christmas issue of the Dandy, 1969 was knocked down for a strong £1,010. David "Davy" Law (1907-1971) found international fame by introducing Dennis The Menace to unsuspecting Beano readers in March 1951. 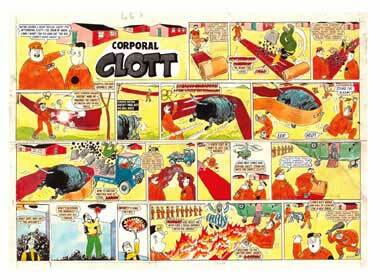 He also penned Beryl The Peril, Captain Hand and the accident-prone nitwit, Corporal Clott. In the end even Dennis's fiendish pet, the Abyssinian wire-hared wolf hound, Gnasher, got his own strip series. Buster was the first comic published by Fleetway in 1960 and Bill Titcombe's son of Andy Capp started his adventures in direct competition with D C Thomson's Topper and Beezer. The comic outlasted both, continuing for the following thirty-five years. We offered a No 1 issue with free gift Balloon Bleeper along with a rare Buster pin badge and Editor's letter to 1930s and 40s Amalgamated Press artist Roy Wilson. 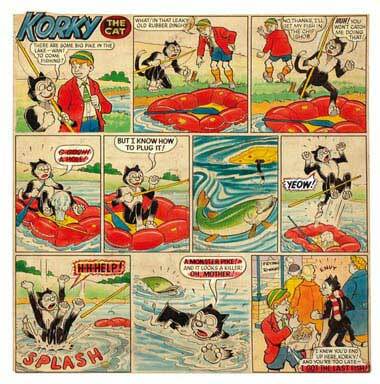 The lot busted through to £338, a very strong price for a comic never sold in three figures before now. Our U S section highlighted a Fine copy of Detective Comics # 98 from 1945 which realised an above guide £166 and Human Torch # 27 starring the Asbestos Lady but with a cover that had small sew holes at the spine having been at one time part of a bound volume. In otherwise clean condition, this Very Good copy sold for £143, also above guide price. Our silver Age section offered an extremely worn pence copy of Amazing Spider-Man # 1, its back and front covers separated at the spine. Even so this Fair graded example went for a winning bid of £355 underscoring Spidey's enduring popularity. More Amazing was his issue # 12 with Doc Oc cover which in Very Fine/Near Mint grade saw this cents copy reach a £660 high, 25% over guide. It's holiday time so let me extend all our good wishes to you and your families for a peaceful, well earned break, with no shortage of entertaining, laugh- inducing reading material.